THE Edinburgh-Shenzhen Creative Exchange has recently partnered with Shenzhen Stories, an NGO initiated by two expats in Shenzhen, to invite a handful of storytellers to share stories in conjunction with the annual Shenzhen International Cultural Industries Fair (ICIF). The event was also held in response to the International Story Telling Festival that takes place in Edinburgh. Shenzhen and Scotland have established a friendship exchange relationship. The event, titled “Continue,” featured people from all over the world who now find themselves in cultural industries in Shenzhen speaking on moments in their lives that forced them to decide whether or not to continue. Expats working in cultural industries in Shenzhen were invited to share their stories at this special event. The speakers included an urban visual artist, Jorge, from Ecuador who started the “graffiti revolution,” Brittan who learned that plans aren’t the only thing to live for, theater educator Clayton who found that a life spent giving to others beats serving yourself and independent filmmaker Nausheen who discovered happiness only after she left her hugely successful career behind. Also there was Rudy, who at the age of 58 discovered a new family that had been kept from him his whole life and is now starting over with brothers and cousins who have accepted him and welcomed him without blinking. 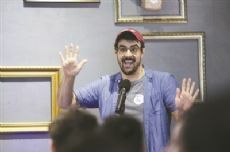 Shenzhen Stories started in an animation studio in Nanshan, when Siobhan Lumsden and Trey Hobbs asked what it would be like to host an event that could connect people in a meaningful and intentional way. Every month since December 2016, Shenzhen Stories has been hopping around the pubs and coffee shops of Shenzhen creating a platform for Shenzheners to share their stories. With themes, like “Strangers,” “Unlucky,” “Smoke and Mirrors,” “First Sight” and “Close Calls,” the stories have ranged from the absurd to hilarious to heartbreakingly inspirational and, best of all, always true.